Okay…this was pretty cool. 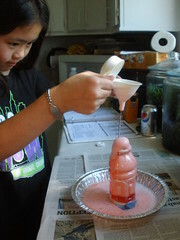 Olivia has been learning about volcanoes in her homeschool science lessons. To reinforce what was read during the day, the curriculum I am using this year (Sonlight) recommended doing an experiment to demonstrate volcanoes and lava flow. We followed the experiment directions for making a “volcano.” Although we could have hidden the bottle by putting clay or tinfoil over it to make it look more like a volcano, we chose not to do that. 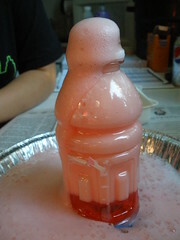 Instead, we focused on the “lava” making and erupting process. 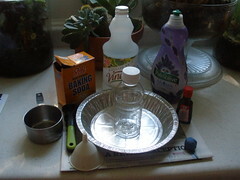 There are only a few ingredients that you need to do this experiment: baking soda, vinegar, dish soap, food coloring, a pie tin, bottle, bit of clay (we used it to hold the bottle in place), funnel, measuring spoons, measuring cup, and newspaper. Items needed to create an at-home volcano. After putting the baking soda and dish soap into the jar, you add the vinegar and food coloring through the funnel. Quickly remove it because the chemical reaction is immediate. “Mom, can we do it again?” both the girls asked. “Once the bottle dries out a bit and there’s no vinegar left in it to react with the baking soda, yes,”﻿ I said. It’s always a good sign that they are enjoying science when they ask to do the experiments again and are eager to do more experiments.